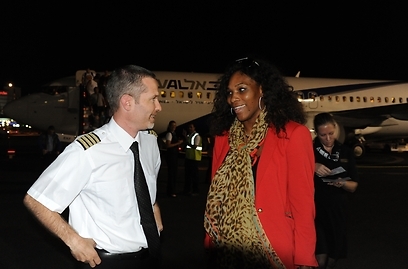 Serena Williams, who is regarded one of the best female tennis players of all times, landed in Israel on Monday evening for a surprise visit. The American player spent the past few days with her sister Venus in Nigeria and South Africa, where the two took part in women empowering activities and competed against each other in a series of exhibition matches. Williams, who is currently ranked third in the world, beat Maria Sharapova in the Masters Tournament finals in Istanbul just one week ago. Now, with some free time on her hands before training for the next season, she decided to vacation in the southern Israeli resort town of Eilat, where she is expected to stay until Sunday. Williams began the past weekend with a three-day visit to Lagos, Nigeria, where she lost to her sister in an exhibition match. She then took off to Johannesburg for a two-day visit which included a gala event at the local casino and another match against her sister, which she won this time. "I LOVE SOUTH AFRICA!!!! I LOVE it. I LOVE it. I LOVE it. And I love everyone here!!! You guys made my trip amaz! I can't wait to come back!" Serena wrote on her Twitter page. Her next stop was the Holy Land, where she arrived after making a stop in Paris, France. At the age of 31, Serena has as many as 29 Grand Slam titles, 15 in single and the rest in doubles with her sister. The current year is considered one of the best in her career, with victories in the Wimbledon and US Open tournaments. Serena also won two gold medals in the 2012 London Olympics – for the third time with her sister as the Doubles champions and for the first time in the Singles – making her the only tennis player in history to complete a golden Grand Slam (winning the Olympic gold medal in addition to the four majors in one calendar year) both in singles and doubles. The city of Eilat, known as an attractive destination for Israelis and tourists from around the world, had hosted the European-African zone group of the Fed Cup Tennis Games for the past three years. The world's leading female tennis players – including Victoria Azarenka, Caroline Wozniacki and Agnieszka Radwańska – enjoy visiting Eilat all year round, mainly due to the weather and the city's excellent tennis courts. It is quite possible that Serena Williams heard about the southern city's advantages from her colleagues before deciding to vacation there. 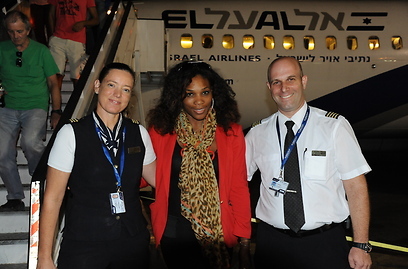 See all talkbacks "Serena Williams vacations in Israel "